The Canarian Weekly is the official Oasis Fm newspaper - packed with details about your favourite local radio station, together with news and features about the local area, national and international news, a full TV guide and much much more! It's a full size newspaper, delivered every Friday - and, best of all, IT'S COMPLETELY FREE! 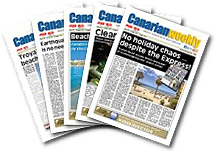 The Canarian Weekly has already been delivered across the south of Tenerife since 1997, and is available in bars, shops, supermarkets, tourist offices and other public places. For local businesses there are some AMAZING advertising deals in the Canarian Weekly - combining a slot in the newspaper, with radio advertising on Oasis Fm itself. No one else can offer you the best of both worlds! Radio advertising backed up with newspaper advertising - or newspaper advertising backed up with radio - whichever way you view it, you'll be amazed at how cost effective our rates are! Our team will be happy to talk through how you can take advantage of this UNIQUE way of promoting your business.